I tried a new tact with systems of equations this year. I started with a card trick. Students choose two cards, then add and subtract the numbers. I quickly tell them which cards they have. We progress to larger numbers and even negative numbers before I explain the magic trick. For example, x + y = 12 and x - y = 2. Some students are able to use guess and check to solve which is fine for the simpler systems. I borrowed an idea from the progressions documents and wrote 10 = 10 on the board. Below it I wrote 2 = 2. Then I had students think about adding the left sides and right sides of the equation to see if the value remained true. So, 12 = 12 is true. Students discovered it was true for addition, subtraction, multiplication, and division. We took this idea and applied to x + y = 12 and x - y = 2. Students saw x + y + x - y = 12 + 2 or 2x = 14. So, x = 7 and substitution shows y = 5. We repeated this several times with systems using larger integers for x and y so students could not simply guess and check. Then I borrowed a lesson from Yummy Math called Souvenirs and Concessions. I focused mainly on writing equations for the situations. This activity made it extremely easy for students to see how elimination with multiplication would work. For example, if 1 hat and 1 poster is $25, and 4 hats and 2 posters is $88, then the system can be written as 1h + 1p = 25 and 4h + 2p = 88. Students can try subtracting one equation but both variables remain. We think a bit and then realize that if 1 hat plus 1 poster is $25, then 2 hats plus 2 posters is $50. The students rewrite the equation and solve the system. Students seemed to have an easier time accepting that each term of an equation can be multiplied by any number and the value of the variables remain the same. Then I used Scott Keltner's activity using Little Debbie's Oatmeal Creme Pies as inspiration and wrote my own activity using Oreos. So, select this link (answer key now provided) to find everything you need to write a system using regular Oreos and the Triple Double Oreos. Yes, it is quite necessary to have enough Oreos to go around! It did help to have the Triple Doubles in the class for comparison so students could see the regulars had 2 wafers and 1 filling while the Triple Doubles had 3 wafers and 2 fillings. Dialogue with "would you rather?" However, I still struggle with some students who simply guess with no reasoning and then claim they can get it "right" without doing the math. I realize they haven&apos;t accepted that several answers can be right...they are still locked into "answer getting". I'm trying to work in function notation in a better way. I started with Robert Kaplinsky's 100 by 100 In-N-Out Burger activity and it worked really well. I highly recommend. From there I wrote this activity for U-Haul rentals. Notice what I did with function notation trying to bring in CCSS. Feel free to use and give feedback. I will let you know how it goes. Dreaded parallel lines cut by transversal and angle relationships...what does dialogue look like? I was thinking of ways to get struggling students to classify alternate interior, alternate exterior, etc. angles. I thought about having the kids make up the names themselves! What a great way to start a dialogue! I imagined the discussion, arguments, suggestions, etc. and couldn't wait to start. I would give them the vocabulary for corresponding angles and show them those pairs, then they were on their own. It was less than ideal. In fact, if someone had walked into the classroom while my kids were thinking of names, they would have thought I was a teacher with no plan and no control. Lots of "What are we supposed to do?" "Name them what?" "What do you mean?" I visited each group and coaxed them along. "Left middle" said one group for angles 4 and 5. Someone else just decided to name them "Fifi". So, I gathered the suggestions and read them to the class. Then I said, "Are you ready for the real names? Let me know if they make sense." I began naming the angle pairs slowly. For angles 4 and 5 I said "Same side...(ooohhhh, the class murmered)...interior." (Some said "huh? ", then said "oh!".) I went through naming each angle pair. I thought the activity was pretty much a bust...until the kids started having to classify the angles. The confusion, perplexity, and struggle that looked so messy to the outside eye was working wonders on the inside. They paused before naming any angle pair, I could see their minds working. I'm beginning to realize that deep thought on the part of the student does not necessarily look like what I thought it would look like. I had imagined quiet contemplation, maybe some head nodding and a finger on the chin (imagine the thinker pose here). Instead, I am coming to realize that for some kids, thinking is noisy and active. I need to be comfortable with that. I also need to be confident enough with it so that if someone does walk into my classroom, I don't immediately start trying to shush the kids. Noise = thinking in my class and for my current students. It's working so far for me! I never anticipated the number of "aha" moments I would have by encouraging my students to talk or write about what they are thinking. The most recent was a simple warm-up on combining like terms. A student thought that 2x + 3x = 5x^2. Lately I've been asking students to give me "convincing arguments" about concepts. High school students like to argue, so I thought I'd go with it. So, my question to students was "Give me a convincing argument as to why 2x + 3x not equal to 5x^2?" That's a hard question to answer. Most students responded about the rule being that you shouldn't add the variables. They are "like terms" so x + x won't equal x^2. From there I was inspired by the "always, sometimes, never" questioning from the Mathematics Assessment Project. I asked "Is 2x + 3x = 5x^2 always, sometimes, or never true? Justify your reasoning and give counterexamples." Most of the students said it was never true, some said it was always true. I had to explain how to find counterexamples and we started substituting values for x. One student noted that x = 1 made the equation true. And then we puzzled about what else would make it true. 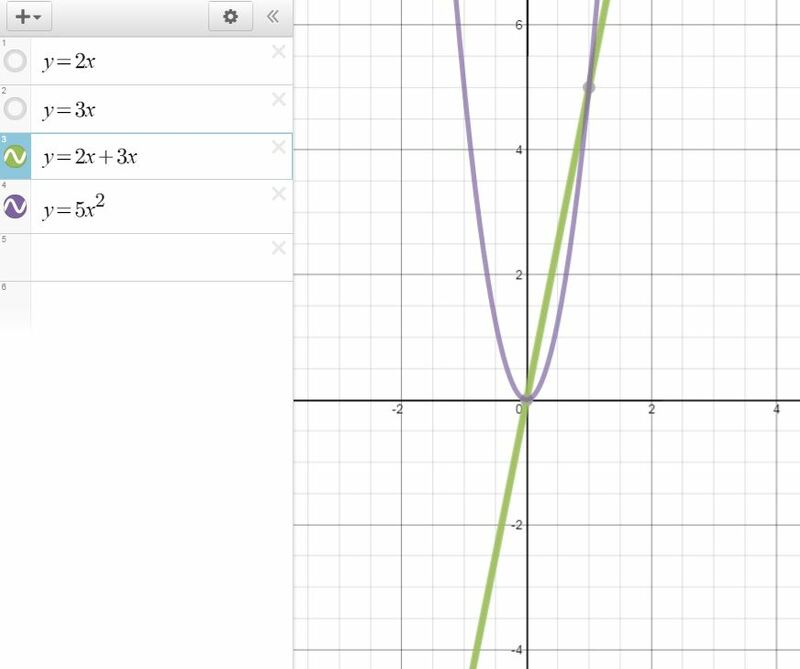 I grabbed Desmos, and showed students that 2x and 3x could be graphed using y = 2x and y = 3x. Two lines...so, what happens when you add two lines? You just get a different line...but it is still a line. The students predicted a shift, but instead the line just got steeper. Then we graphed y = 5x^2 and saw the parabola. Quite clearly students saw that 2x + 3x cannot be 5x^2 because you can't add two lines and get a parabola. However, they also saw that 2x + 3x = 5x^2 was sometimes true...when the graphs intersect. We substituted x = 0 and x = 1 to show that was true. Students rarely think about an equation being false, let alone sometimes true. What a great way to show them visually what is going on. It wouldn't have happened unless I had been asking my students to give me convincing arguments, and using formative assessment to learn what they knew. I know that if students can make me curious, I will have more success making them curious. A point lives in the 0 dimension. It has no size and no shape. It only has a location. A line lives in 1 dimension. It has no thickness. It extends infinitely in both directions. A line segment is a finite portion of an infinite line. It has two ending points. A ray is a half-infinite or "half-line" with a starting point and no ending point. Next, have students watch the video, The Dot and The Line: A Romance in Lower Mathematics based on the book by Norton Juster. This is an award winning cartoon from Chuck Jones which was completely hand drawn! Tell students that while watching the cartoon, they must determine if the dot is really a point and if the line is really a line. They must use the definitions just presented in class and support their reasoning. 1) According to the mathematical definition of a point, can the dot in the cartoon be called a point? Support your answer. No, the dot had a shape. No, the dot had a shape and it kept moving, not in one location. Yes, because it was on the line. Yes, it was a point because it had no dimension. No, because it had a shape. No, because it wasn't named. No, because the dot had dimensions. No, because points don't move. No, because a point has no shape or size. No, because there is no way to know how big or wide it is. Yes, because points can be anywhere. No, because it moves all the time. No, because it didn't belong to a graph. No, because it is not fixed in one spot. I love this! Every student used some sort of knowledge about the point to support their reasoning. The response "Yes, because it was on a line." was very thought-provoking for me...because that is a way to describe a point. I thought it interesting that many students connected a point with being stationary because the definition includes that it describes a location. I think a follow up question to this can now be: Can a point move? Why or why not? Is the line depicted in the cartoon actually a line? Justify your reasoning. No, because it turned into other shapes. No, it wasn't always a line, sometimes it curved. No, when it was different shapes it was in different dimensions. Yes, it is just a line that formed into different shapes. Yes, even though it changed shapes it was still a line. No, because lines never end and this one did. Yes, because no matter what shape it took, it was made up of lines. Yes, because it has an infinite number of collinear points. Yes, it was almost always a line because it kept continuing. Yes, it was always a line but not always straight. No, because sometimes it stopped at the bottom. Yes, because it went on forever. No, because it turned into shapes and connected to itself so it was not infinite. No, the line because different shapes. Yes, it was always a line until it became an angle with the dot. Yes, because it never stopped. Yes, because never once did it stop. It was so long and it looked like it had two arrows. No, not always because it had an end at sometimes. Yes, because a line is an infinite number of collinear points. Again, amazing ways to think about a line! Some were "textbook" answers, completely fine and described infinte number of collinear points. But I think my favorite is "Yes, it was always a line until it became an angle with the dot." I will be presenting these to the class and see what they have to say about the answers. I'm thrilled by the complexity of their reasoning. Can't wait to see what they come up with next! Dreading something means doing everything possible to avoid it...so change the game. Reward yourself with something positive, let's turn dread to desire. What does this mean in the math classroom? I told her I didn't know yet what the math problem looked like but it probably has a -32 in it. And I wrote -32 on the board. "Then what happened?" I asked. The student took the marker and wrote -20, looked at it, said "no", then wrote +20 on the board. I told her to turn that into a math problem and she wrote -32 + 20 = -12. This turned into a problem that was not so scary. So a student who said she didn't do word problems successfully solved one. The next word problem was about football yard gains and losses and she said, can we do that one now? I'm now toying with the idea of making a promise to the kids that we will act out EVERY word problem we come across...I'm wondering if I can actually do that. But I'm also wondering if that will help turn their dread of word problems into an anticipation to see what they mean...and thus a method to solve them. It's the first week of school and getting kids to talk freely about math is tough. Students (especially 9th and 10th graders) may not know anyone in the class, they are unsure of themselves, they want to make a good impression on the teacher, and they believe everyone is looking at them...(all very normal thoughts for teens). I've used this activity several times but this is the first time I've used it so early in the school year. My goals were to get kids to talk about math, use correct math vocabulary, minimize "I don't know what to say" and possibly learn from their classmates. I think the activity accomplished all of these goals in some way. Explain that students will be paired up, then each will read the descriptions to their partner and their partner must guess the word or phrase. One of my favorite ways to pair kids up is to distribute a playing card to each student. Then tell them they must get up and find the person with the same number and color. (So a red 2 finds another red 2, a black four finds another black four, etc.) Tell them they have 2 minutes to find their partner and start quizzing each other. Then (and this is important) set a timer for 2 minutes! Walk around the room and listen. First recognize that more students are talking about math than before...so yay it's working! After two minutes, tell students to go find someone with the same number but a different color and set the timer for another two minutes. Next pairing can be an even numbers must find even numbers with same color (odds must find odd numbers with same color). Then switch to even number and opposite color, etc. Depending on the number and difficulty of concepts, I try to do about 4 pairings. If you do too few, they don't get comfortable. If you do too many, they stop talking about math. Because I am circulating and listening in, I often see 100% of kids talking about math. Sometimes I listen and write down words or phrases I hear and share them with the class after the activity. I tell them these are my favorite things. I always include an error from someone and tell them how happy I was to hear that because it allowed the pair of students to have a deeper discussion about math. Here's why I think this activity gets them talking about math. They have the vocabulary in front of them. They can take turns reading or answering. They only have to say it in front of one other person. Listening helps them with their pronunciation (non-collinear is a mouthful for non-verbal kids). They know the activity will end. (The timer is important.) They believe they can be successful before they start. Here's my new goal. How do I create all those components in every activity I do? I think these are the key parts to getting kids to talk about math. So, I've finally rearranged curriculum in a way I've always wanted to try. As a curriculum writer, I was atempted to change things in a big way...but that is tough to do when working for a mainstream publisher. The wonderful thing about being back in the classroom is that I get to respond to my students' learning rather than teach in a prescribed order. My HS Geometry students had just finished learning trig and were getting quite good at finding missing angles and side measures of right triangles. Most did amazingly well on the test and it was time to start the next chapter. Predictably, the chapter started with area of a rectangle, triangle, trapezoid, then area of a polygon with the apothem given. Finally, students would use trig to calculate area of a regular polygon using only the side measure. It struck me that here they are at the height of their learning and I was going to start easy with the next chapter and build up to trig again. Instead, I started with the hardest section first. I distributed a large regular polygon (with side length given) to each person in a group (different polygon for each group), then told them they have all the knowledge in their head to find the area. I gave them a ruler but told them they couldn't use the measures. They immediately started drawing lines on the figures. They got stuck when trying to find area of each shape...but some were making progress. I'll be honest, I need to get more comfortable with my teaching because I should have let them continue to explore in the direction they were going. But there were too many possibilities and I just didn't think I could manage them. So...I gave them all a hint. I said "Find the center." They immediately drew diagonals and saw the triangles. We reviewed area of a triangle and someone drew an altitude. But they got stuck because they didn't know the angle measures. One student numbered the angles in the center. I showed that under the document camera and it was a quick jump for them to realize the total number of degrees is 360. I just finished a great project with my kids in geometry so thought I'd share. After watching fellow teacher Mark Furtado create clinometers with his class, (thanks Mark!) I wanted to do the same. Click here to see how to create one. However, I knew I didn't have enough time to have kids partner up for a project...AND I wanted the kids to find out something amazing. 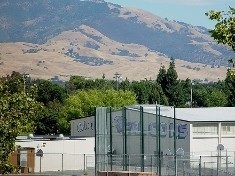 Our school is located in Northern California (East Bay) near Mt. Diablo. Although Mt. Diablo is relatively short, the surrounding areas are flat...so it can be seen from long distances. Here's a picture of our school with Mt. Diablo in the distance. I wanted the kids to figure out how far away the school is from the center of the base of the mountain. Students found how useful proportions can be and converted 15.5 cm to miles. 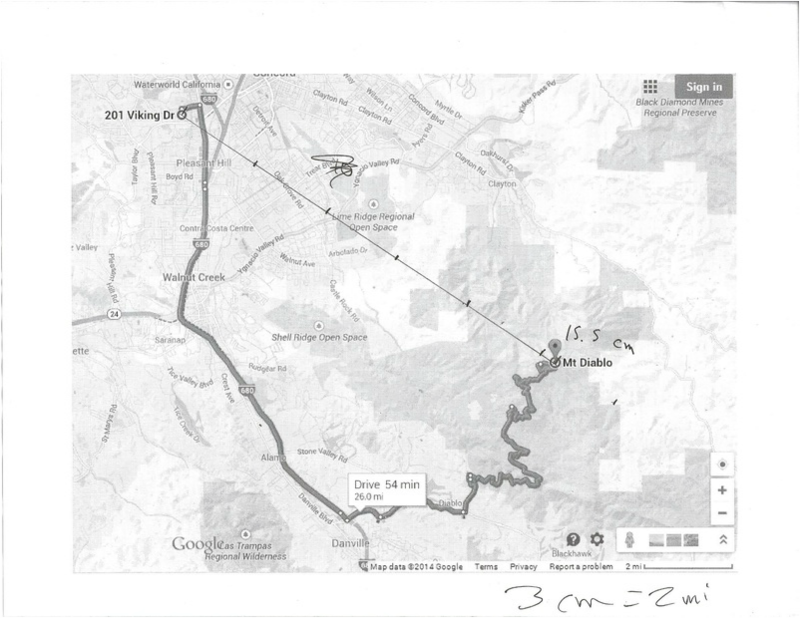 So, the straight distance should be about 10.3 miles. The bonus came when a student piped up and asked what the degree measure should have been. Hmm...how to find the angle when two measures are given...ah yes...inverse tan! So, were all the kids working equally on this activity? No, in fact, the whole class was working in groups on an angle of elevation and depression worksheet. I began the activity by saying "hey...let's use trig to find out how far we are from Mt. Diablo! I need three teams to find the angle of elevation." Immediately, my most active kids jumped up and begged to go outside. I gave them a quick refresher on how to use the clinometer and they listened closely. I also told them they had 5 minutes to get the measurement. So, these 6 kids were invested. I started talking about elevation and one student googled it while another argued he just finished taking numerous weather measures in physics and KNEW the elevation was 37 feet. So, we went with his measure rather than the googled elevation. Now two more kids were in. I wondered aloud how we could find the actual distance and quite a few said to google it. Now they are invested...(remember...those who weren't really interested were still working in groups...I have to say...they are really a great group of kids.) It was great having the google map up so they could see the winding roads for driving. At least they could tell the straight distance would be less than 26 miles! What I think I liked best about this activity is that students were allowed to go in and out of it as they wanted. Some students stuck with it the whole way through...others just wanted to complete their classwork. But either way, they had a choice and they were all doing trig. We'll see how this goes next year!